To report on the microbiology, management, and visual outcomes of intravitreal injection (IVI)-associated, culture-proven endophthalmitis. All patients seen at a tertiary referral center with culture-proven endophthalmitis associated with an IVI between June 2007 and July 2017 were included in this retrospective analysis. Thirty-five patients with culture-positive endophthalmitis following IVI were identified. All gram-positive organisms (34 of 35) were susceptible to vancomycin. Cases due to pathogens associated with oral or respiratory flora were common (31.4%, n = 11), presented earlier (2.0 days vs. 4.6 days, P < .001), were more likely to undergo pars plana vitrectomy (81.8% vs. 25.0%, P = .002) and had worse visual acuity outcomes. IVI-associated endophthalmitis pathogens and anti-microbial susceptibilities in the Pacific Northwest are similar to those reported from other geographic locations. Bacteria associated with the oral and respiratory flora are common isolates that result in a more aggressive course and worse visual outcomes. The widespread adoption of pharmacotherapy delivered by intravitreal injection (IVI) has transformed the management of many ocular diseases. Every injection, however, carries a small risk of endophthalmitis. Published rates of endophthalmitis following IVI range from 0.016% to 0.056%.1–9 Although the overall risk of a single injection is low, many patients with chronic retinal diseases require long term, if not indefinite, treatment and are exposed to a progressively higher cumulative risk over their lifetime. According to Medicare records, fewer than 5,000 intravitreal injections of a pharmacologic compound were performed annually prior to 2001.10 Since then, there has been rapid growth in the use of intravitreal injections, with more than 2.5 million performed in the US in 2014.11 Compared to postoperative endophthalmitis following cataract surgery, which has been studied for decades, information regarding the clinical course, microbial etiology, and treatment outcomes in endophthalmitis following IVI has been emerging in only the last decade. 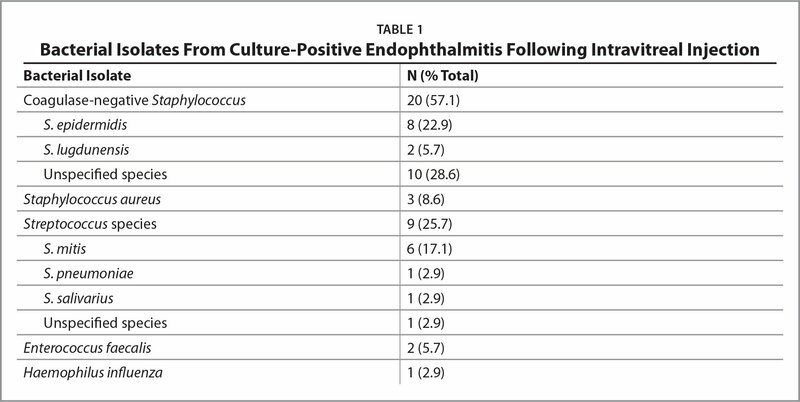 Analysis of microbial data from culture-proven post-IVI endophthalmitis is even more limited, with the total number of culture positive cases ranging from 26 to 68 in the largest meta-analyses.4,5,12,13 Coagulase-negative Staphylococcus is the most common isolated pathogen in both processes, but Streptococcus species and other organisms associated with the oral and respiratory flora have been found more commonly in post-IVI endophthalmitis than postoperative cases.12,14,15 The clinical follow-up after intraocular surgery, for which patients are routinely seen on multiple postoperative visits, may allow for closer monitoring for infection and is different than the follow-up commonly applied after IVI. Furthermore, intraocular and topical antibiotics are routinely used during and after intraocular surgery; although similar prophylactic antibiotics following IVI have been shown to be ineffective in the prevention of endophthalmitis, their absence may contribute to differences in microbial etiology and treatment response between post-IVI and postoperative infections.16–18 The purpose of this study is to describe the microbial etiology and clinical outcomes of culture-positive endophthalmitis associated with IVI in the Pacific Northwest. This retrospective study conducted at a single, tertiary referral center was approved by the institutional review board of Oregon Health & Science University and adhered to the tenets of the Declaration of Helsinki. The electronic medical records of all patients treated at the Casey Eye Institute of Oregon Health & Science University from June 1, 2007, to June 31, 2017, were queried for a relevant International Classification of Disease (ICD) Ninth Revision diagnosis code (360.00, purulent endophthalmitis, unspecified; 360.01, acute endophthalmitis; 360.03, chronic endophthalmitis; 360.19, other endophthalmitis) or ICD Tenth Revision diagnosis code (H44.001, unspecified purulent endophthalmitis, right eye; H44.002, unspecified purulent endophthalmitis, left eye; H44.003 unspecified purulent endophthalmitis, bilateral; H44.009, unspecified purulent endophthalmitis, unspecified eye; H44.19, other endophthalmitis) and the presence of a positive culture from an intraocular sample. The electronic medical record of cases meeting the ICD and culture inclusion criteria were reviewed to determine whether the patient had received an intravitreal injection in the infected eye within the 15 days preceding presentation. Cases involving the injection of a drug suspension, such as an anti-vascular endothelial growth factor (VEGF) agent, or drug releasing implant were included. Cases were included regardless of whether the preceding IVI was performed in house or by a referring physician. Following identification of culture-positive, post-IVI endophthalmitis cases, type of pharmacotherapy injected, patient age, presenting visual acuity (VA), time between injection and presentation of endophthalmitis, pathogen species, antimicrobial susceptibilities, method of endophthalmitis treatment, and VAs from the exam closest to the one month and 3-month follow-up date were recorded. Quantitative variables are reported as mean ± standard deviation and qualitative variables are reported as percentages. A Chi-squared test was used to assess the statistical significance of cohort differences. Due to the poor VA frequently associated with endophthalmitis and the problematic conversion of the associated non-numerical VAs to quantitative numerical values, such as logMAR acuities, VAs were binned based on median presenting VA into hand motion (HM) or worse and count fingers (CF) or better for statistical analysis. Thirty-five cases of culture-positive, post-IVI endophthalmitis were identified. Twenty-one cases (60.0%) were referred from physicians outside of the academic tertiary referral center. Thirty-four cases (97.1%) were associated with injection of a VEGF antagonist (10 bevacizumab [Avastin; Genentech, South San Francisco, CA], five ranibizumab [Lucentis; Genentech, South San Francisco, CA], 11 aflibercept [Eylea; Regeneron, Tarrytown, NY], and eight recorded as an unspecified anti-VEGF agent from a referring provider), whereas one occurred after injection of a dexamethasone embedded intravitreal implant (Ozurdex; Allergan, Dublin, Ireland). Mean patient age was 73.8 years ± 14.2 years, and mean time from IVI to presentation was 3.8 days ± 2.4 days. Presenting VA was available in 33 of 35 cases and ranged from 20/60 to no light perception (NLP), with 63.6% (n = 21) of patients presenting with HM vision or worse and 21.2% (n = 7) of patients presenting with light perception (LP) vision or worse. Thirty-four of 35 isolates (97.1%) were gram-positive bacteria. Coagulase-negative Staphylococcus was the most common isolate (57.1%, n = 20) (Table 1). Bacteria associated with the oral or respiratory flora made up 31.4% (n = 11) of isolates and included nine cases (25.7%) of Streptococcus species and two cases (5.7%) of Enterococcus faecalis. Finally, there were three cases of Staphylococcus aureus (8.6%) and one case of Haemophilus influenza (2.9%). There were no fungal isolates. All isolated gram-positive bacteria (n = 34) were susceptible to vancomycin (Vancocin; Pfizer, New York, NY). Of tested organisms, 100% (18 of 18) were susceptible to amikacin, 88.2% (15 of 17) were susceptible to ceftazidime, 93.8% (30 of 32) were susceptible to clindamycin, 92.9% (26 of 28) were susceptible to ofloxacin, and 56.3% (18 of 32) were susceptible to erythromycin. All patients were treated with immediate intravitreal antibiotics. In addition to antibiotic therapy, 11 cases (31.4%) underwent pars plana vitrectomy (PPV) within 48 hours of presentation; four of these cases were due to Streptococcus species: four Staphylococcus, two Enterococcus, and one Haemophilus. An additional four cases (11.4%) underwent PPV after 48 hours due to persistent infection or vitreous inflammation, three of which were due to infection with a Streptococcus species. One-month follow-up data (average 31.9 days from initial presentation) were available in 77.1% (n = 27) of cases and 3-month follow-up data (average 93.8 days from initial presentation) were available in 60.0% (n = 21) of cases. There were no enucleations within the first 3 months of follow-up. At 1-month follow-up, 66.7% (18 of 27) of cases had a VA of CF or better and 44.4% (n = 12 of 27) had 20/200 or better. At 3-month follow-up, 66.7% (14 of 21) of cases had a VA of CF or better and 47.6% (10 of 21) had 20/200 or better. Patients with endophthalmitis due to organisms associated with oral or respiratory flora presented sooner after injection (2.0 days ± 0.6 days vs. 4.61 days ± 4.6 days; P < .001) (Table 2), were more likely to have a presenting VA of HM or worse (90.0% vs. 59.1%; P = .038), and were more likely to have undergone PPV (81.8% vs. 25.0%; P < .001) than cases caused by other bacteria. Cases due to organisms associated with oral or respiratory flora were more likely to have HM or worse VA at 1-month follow-up (66.7%, n = 6) compared to cases due to other organisms (16.7%, n = 3; P = .009). There was no significant difference in days from presentation to the approximate 1-month follow-up visit (30.6 days ± 4.6 days vs. 32.6 days ± 13.7 days; P = .582) between these two cohorts. Although the risk of endophthalmitis following a single IVI is low, the growing number of indications for intravitreal pharmacotherapy, cumulative risk acquired with long term treatment, and associated visual morbidity makes post-IVI endophthalmitis a major concern for patients and their treating physicians. In this 10-year retrospective analysis, we report 35 cases of culture proven endophthalmitis following IVI, of whom 21 were referred from outside providers. Similar to prior studies, we found a wide spectrum of disease severity at the time of presentation and variable clinical outcomes. One case in our series was due to Haemophilus influenza, a gram-negative organism that has been associated with delayed onset post-surgical endophthalmitis, poor visual outcomes and a high rate of evisceration or enucleation.36,37 Interestingly, our case presented acutely 1 day after intravitreal injection and had an excellent VA outcome, with improvement from CF vision at the time of presentation to 20/40 at 3-month follow-up. In summary, culture-positive endophthalmitis following IVI remains a difficult entity to manage and frequently has long-term visual consequences. In this study, the vast majority of cases were due to gram-positive organisms, all of which were susceptible to vancomycin. Commonly implicated bacteria and anti-microbial susceptibilities were consistent with studies from outside of the Pacific Northwest. Bacteria associated with the oral or respiratory flora, such as Streptococcus and Enterococcus species, are common pathogens in post-IVI endophthalmitis and are associated with higher virulence, a more aggressive clinical course and worse visual outcomes. Suto C, Morinaga M, Yagi T, Tsuji C, Toshida H. Conjunctival sac bacterial flora isolated prior to cataract surgery. Infect Drug Resist. 2012;5:37–41. Stevens SX, Jensen HG, Jett BD, Gilmore MS. A hemolysin-encoding plasmid contributes to bacterial virulence in experimental Enterococcus faecalis endophthalmitis. Invest Ophthalmol Vis Sci. 1992;33(5):1650–1656. Jett BD, Jensen HG, Nordquist RE, Gilmore MS. Contribution of the pAD1-encoded cytolysin to the severity of experimental Enterococcus faecalis endophthalmitis. Infect Immun. 1992;60(6):2445–2452. Doshi RR, Leng T, Fung AE. Reducing oral flora contamination of intravitreal injections with face mask or silence. Retina. 2012;32(3):473–476. From Casey Eye Institute, Oregon Health & Science University, Portland, Oregon. This project was supported by core grant P30 EY010572 (Casey Eye Institute) from the National Institutes of Health (Bethesda, MD) and an unrestricted grant to the Casey Eye Institute from Research to Prevent Blindness (New York, NY). Dr. Campbell has received personal fees from Allergan outside the submitted work. The remaining authors report no relevant financial disclosures. Address correspondence to Christina J. Flaxel, MD, Casey Eye Institute, Oregon Health & Science University, 3303 SW Bond Ave., Center for Health and Healing Building 1, 11th Floor, Portland, OR 97239; email: flaxelc@ohsu.edu.